Miami Trace senior Morgan Miller (33) takes the ball to the basket during a Division II District semifinal game against Sheridan Thursday, Feb. 22, 2018 at Southeastern High School. Miami Trace senior Tanner Bryant sets for a shot during a Division II District semifinal game against Sheridan Thursday, Feb. 22, 2018 at Southestern High School. 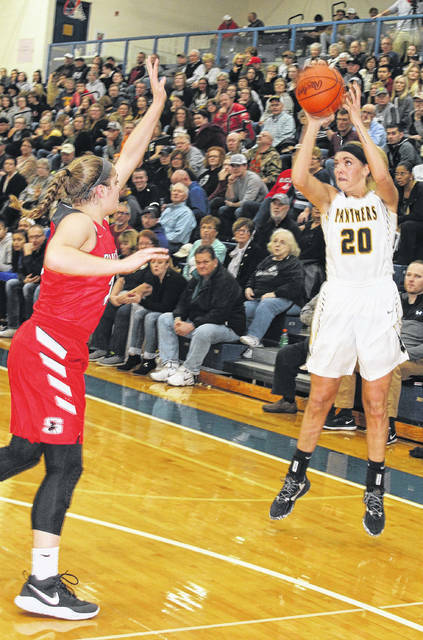 CHILLICOTHE — It was a very promising start for the Miami Trace Lady Panthers Thursday night in the District semifinals against Sheridan. Miami Trace led the first quarter, 19-12. However, after that, the offense just abandoned Miami Trace as the Generals defeated the Lady Panthers, 42-29. In the second quarter, both teams’ offense seemed to fall away, as Miami Trace scored two points to four for the Generals. At the end of the first half, Miami Trace held a 21-16 lead. Unfortunately for the Lady Panthers, Sheridan outscored them 10-3 in the third quarter to take a 26-24 lead. The shots just continued not to fall for Miami Trace in the fourth quarter. 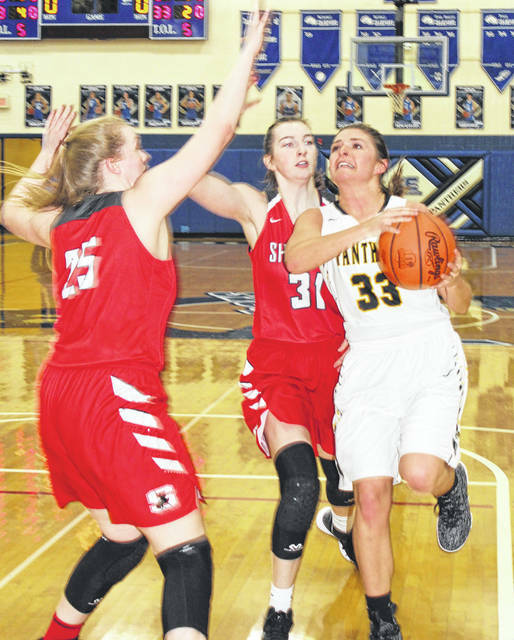 Sheridan outscored Miami Trace 16-5 in the fourth quarter for the final tally of 42-29. Junior Olivia Wolffe led Miami Trace (21-4) with seven points. Seniors Tanner Bryant and Morgan Miller both had six points. Bryant led Miami Trace with nine rebounds and five assists. Sophomore Shay McDonald had three points and five rebounds. Junior Rachel Cooke led the Generals with 15 points. Senior Jena Wharton scored 11. “We did not shoot the ball very well at all tonight,” Miami Trace head coach Ben Ackley said. “I don’t want to take anything away from Thornville Sheridan, they’re a great team. They’re very physical. I thought they were as physical a team as we’ve played all year. I thought (their physicality) took some energy away from us. “We had some looks that we should have made,” Ackley said. “We just didn’t do it tonight. There’s nothing I can say to make Victoria Fliehman, Tanner Bryant and Morgan Miller feel any better. I’m just very proud of these seniors, for the legacy they’ve left. “They’ve left this program so much better than they found it, it’s unbelievable,” Ackley said. “We’ve won 112 games in the six years we’ve been here. To say that you came in as a group and did what they’ve done, I just can’t say enough about them. “I told them, once they get 72 hours removed from this, they’ll have a lot of great memories,” Ackley said. “They’ve had a heck of a run. They’ve done it the right way each and every day. They are a great group of kids. It’s my honor and pleasure just to be a part of their lives. “Our seniors have led so much,” Ackley said. “They go to youth camps, youth travel league games. Our entire team when to support our seventh and eighth grade teams at Washington Court House. They’ve set our program in a position where it’s going to be tough for the juniors, sophomores and freshmen to fill those shoes. “Morgan’s going to Kent State,” Ackley said. “She’s a very good student. One of the best personalities I’ve ever had in a kid. She played her best game, possibly of her career, tonight. “Victoria, the last month and a half have been grueling,” Ackley said. “She’s at practice every day. She’s all about Miami Trace. She’s beloved by each and every one of her teammates. “Tanner Bryant is arguably the best player in school history,” Ackley said. “She is right up there with the Sam Leach’s and Jenna Cobb’s. She brings the total package. “Those three will really be missed,” Ackley said. “When we come back after our mandatory 28 days off, we’ll be back at it harder than ever,” Ackley said. MIAMI TRACE — Olivia Wolffe 2 (1)-0-7; Cassidy Lovett 0-1-1; Becca Ratliff 1-2-4; Shay McDonald 0 (1)-0-3; Tori Evans 0-0-0; Olivia Fliehman 1-0-2; Tanner Bryant 2-2-6; Morgan Miller 2-2-6. TOTALS — 8 (2)-7-29. Free throw shooting: 7 of 10 for 70 percent. Three-point field goals: Wolffe, McDonald. Combined field goal shooting: 10 of 42 for 24 percent. Three-point field goal shooting: 2 of 19 for 11 percent. Rebounds: 23 (7 offensive). Turnovers: 14. SHERIDAN — Aubrie White 1-0-2; Grace Conrad 0-0-0; Jena Wharton 1 (2)-3-11; Sara Cooper 1-1-3; Liberty Justice 0-1-1; Kendyl Mick 1-4-6; Mikayla Rhodes 0-0-0; Rachel Cooke 2 (2)-5-15; Emma Conrad 2-0-4; Claire Montgomery 0-0-0. TOTALS — 8 (4)-14-42. Free throw shooting: 14 of 19 for 74 percent. Combined field goal shooting: 12 of 33 for 36 percent. Three-point field goal shooting: 4 of 13 for 31 percent. Turnovers: 21. Offensive rebounds: 10. Thank you to Karl Kellenberger for providing the box scores and statistics all season once again for the Lady Panthers.